The El Nino-Southern Oscillation (ENSO) is well known to have profound impacts on global climate. Many asymmetric features exist between its warm phase of ENSO (El Nino) and cold phase (La Nina), but their causes are still not fully understood. They applied this new method into the study of ENSO dynamics for the first time, and quantitatively diagnosed the role of various ocean feedback processes in the low-frequency variations of ENSO, revealing the physical mechanism of the latitudinal shift of significant ENSO temperature anomaly from the eastern equatorial Pacific to the central equatorial Pacific in the early 21st century (Guan and McPhaden, 2016). 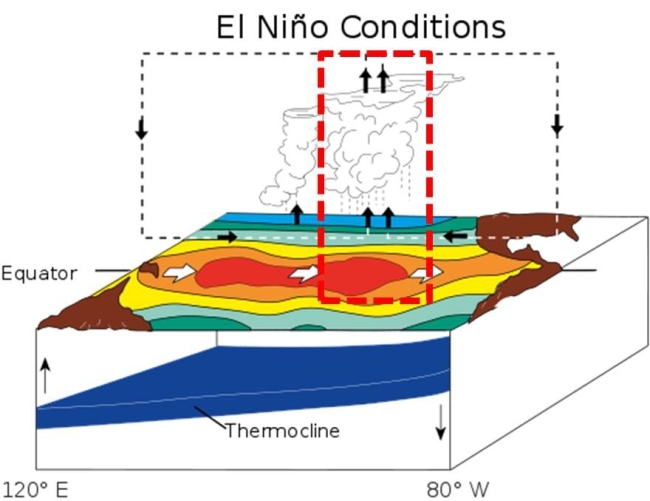 The team further examined the role of various oceanic feedbacks in forming three aspects of ENSO asymmetry: the amplitude of anomalous temperature during the mature El Nino events is larger than La Nina in the equatorial eastern Pacific; in the equatorial central Pacific, the amplitude in mature phase of La Nina is larger than El Nino; and La Nina typically lasts longer than El Nino events. Results showed that the larger amplitude of El Nino than La Nina was due to stronger positive feedback of El Nino in the eastern Pacific. 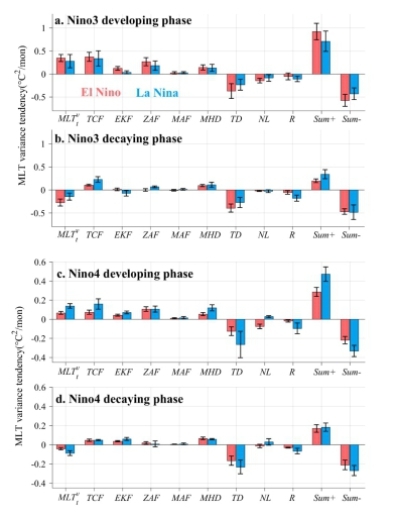 In the central Pacific, La Nina had a faster growth rate than El Nino, which might be induced by stronger positive thermocline feedback in the developing phase and less nonlinear damping effect. 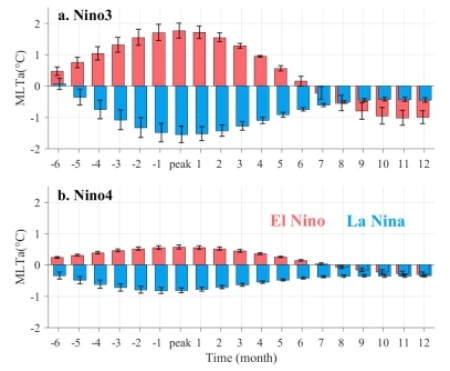 The asymmetry of ENSO duration was because the decay rate for La Nina events was slower than for El Nino, as a result of positive thermocline feedback that changed sign to negative for El Nino but not for La Nina. These results apparently are of importance in better understanding of ENSO dynamics and improving of ENSO prediction. 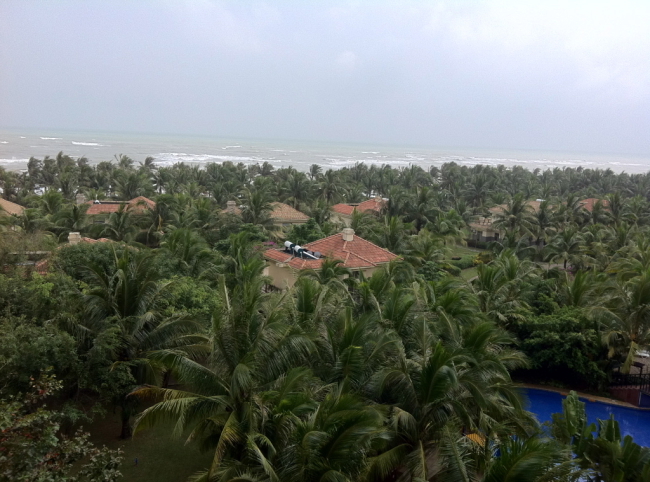 The study was published in Geophysical Research Letters. A research team led by Dr. HUANG Ping from the Institute of Atmospheric Physics and its collaborator found that the different response of circulation to SST anomalies among the models was a key process leading to large inter-model spread of the changes in ENSO SST strength. Why Can’t We Simulate the Central Pacific Type of ENSO Very Well?